This is Call Me A Food Lover’s 100th post. A cause for celebration, especially since my 1 year Blogiversary came and went without me noticing. I have a very wise uncle who gave me a great piece of life advice, telling me “life will pass you by if you let it, so recognize the milestones in your life and take the time to celebrate them”. 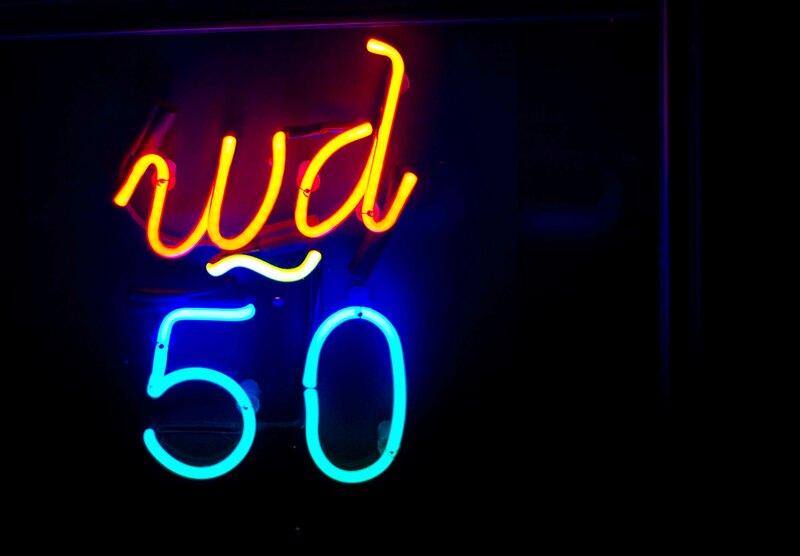 What better way than to celebrate this milestone than by crossing an item off of my culinary bucket list and indulging in the Tasting Menu at WD 50? Wylie Dufresne, chef at WD 50 is known as one of the pioneers of molecular gastronomy. From what I’ve read, he doesn’t like that term because it makes him think of mad scientists, although that’s kind of what he is. I’ve read also read, he’s just hitting his peak which is a good thing for me. I knew in a meal using molecular gastronomic techniques, you had to free your mind and palate of “what you think you know”. I also knew that when chef’s are constantly challenging themselves to push boundaries, that not every creation is a winner. It’s with these 2 thoughts in mind that we entered into WD-50’s Tasting Menu. 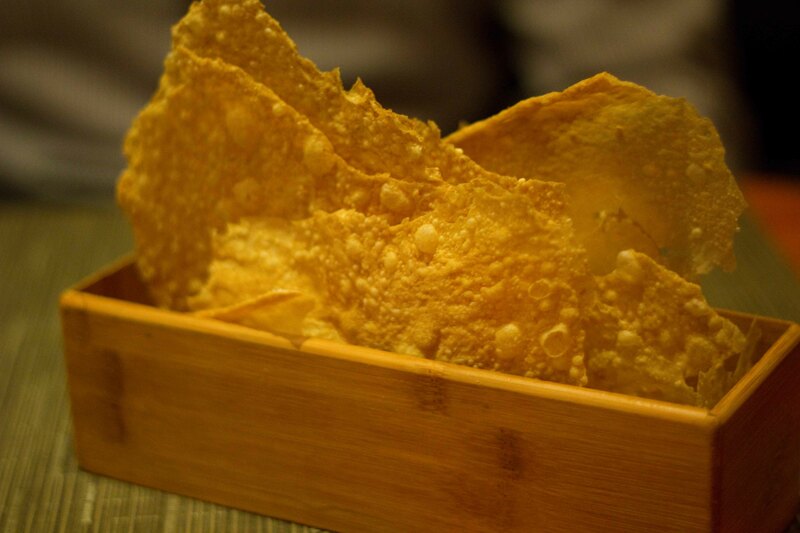 Crispy and delicate flat “bread”. Munching on this was more about about satisfying the craving to eat, rather than filling your stomach with starch. 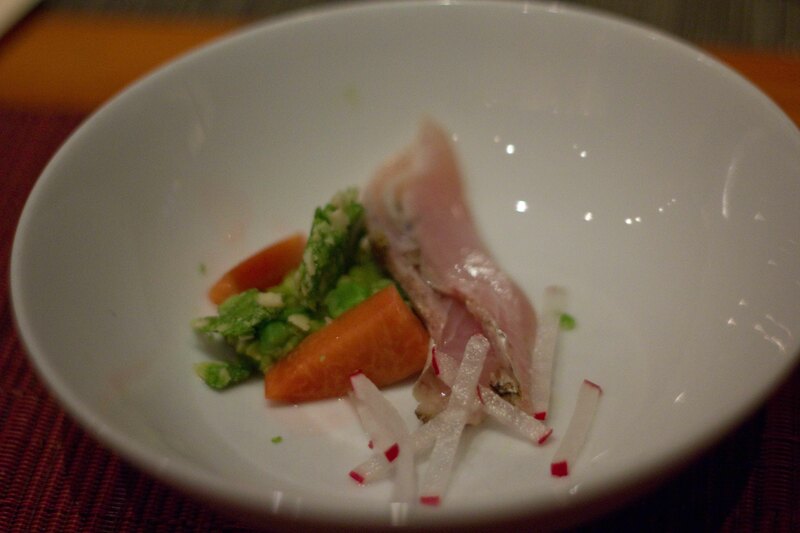 Spanish mackerel with a crunchy English pea and almond brittle and pickled peach. I was taken aback when we were served this amuse bouche. At first look and bite, the plate seemed too “normal” to come from Dufresne’s mind. I ate a bite of the mackerel and its fresh flavour was amazing, but when I combined all the components of the plate together in a bite and I realized that my perception of what my eyes saw as “normal”, my taste buds were to discover something totally unique. 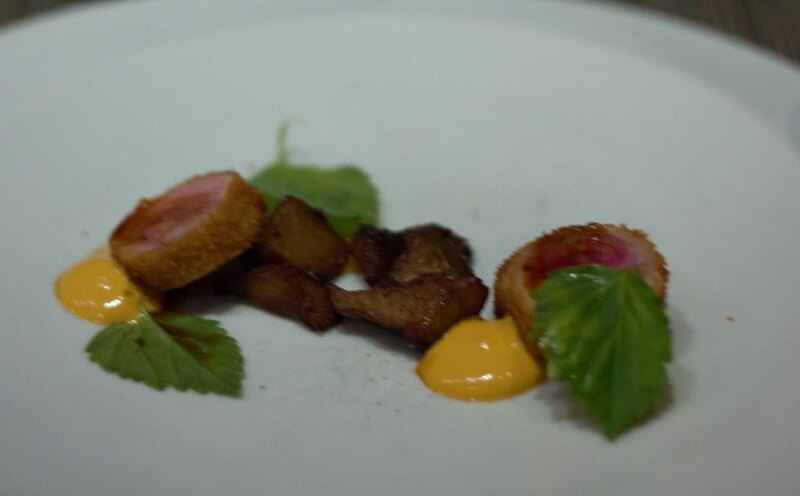 This is the genius of Wylie Dufresne that would carry throughout the meal. I have to admit, this dish was a bit of a blur for me. I was fighting with the lack of light and trying to get a focused photo when I noticed that the “bagel” was starting to melt. The bagel was made of cream cheese ice cream and eaten fully composed, the bite tasted exactly in taste and nothing in texture like a smoked salmon bagel. 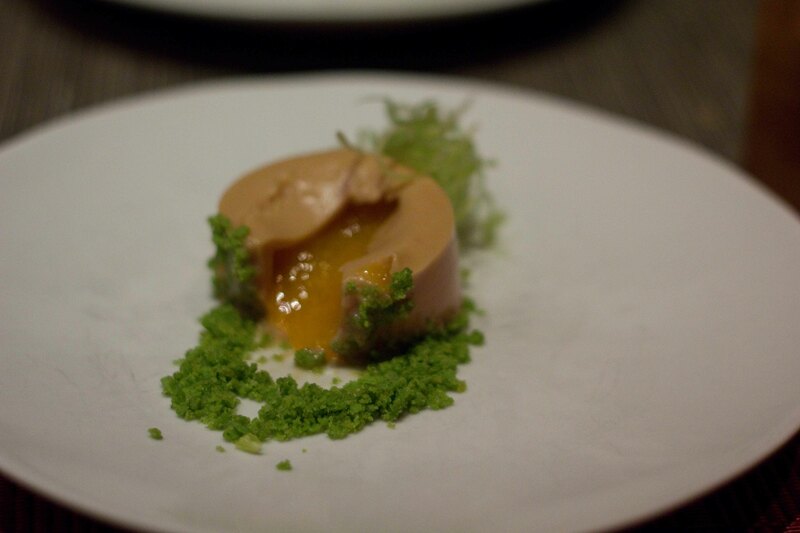 Foie gras passionfruit and chinese celery. A beautifully presented dish, but where was the passionfruit? Why inside of course! 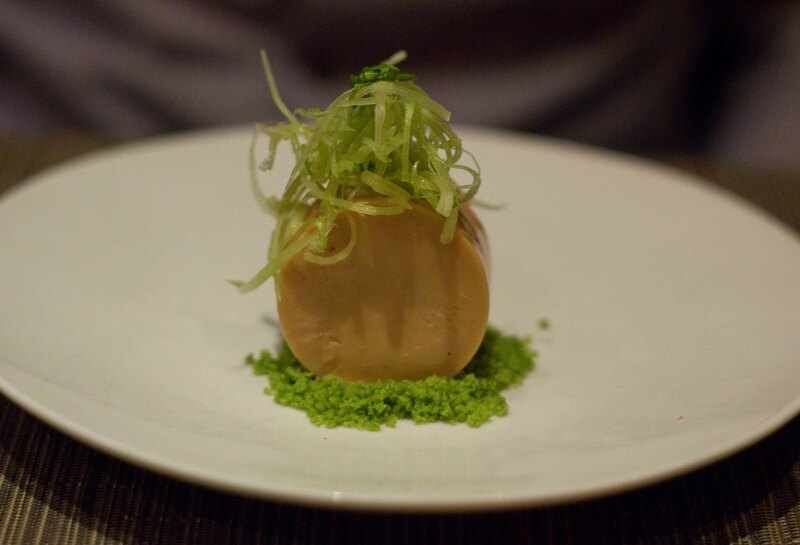 The crumbled dehydrated Chinese celery added texture while the tart passionfruit center was a wonderful pair to the ultra rich and smooth foie gras. 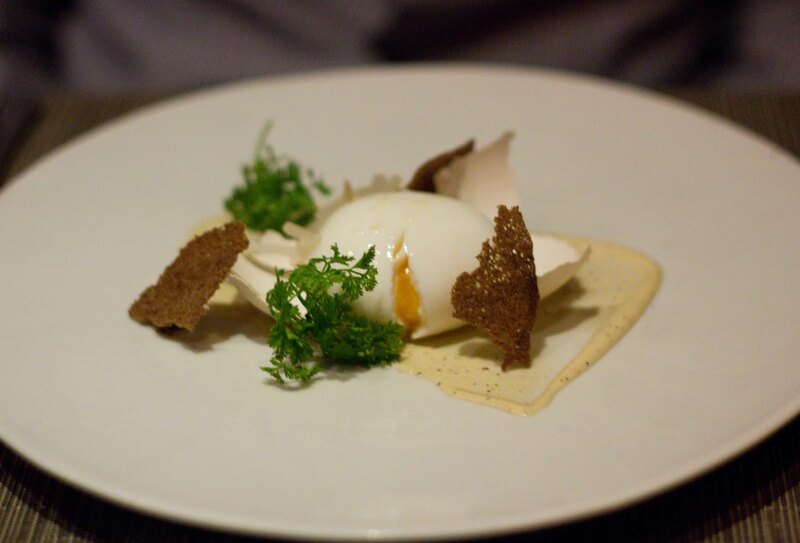 Poached egg in the shell, pumpernickel, caesar dressing, lily bulb. 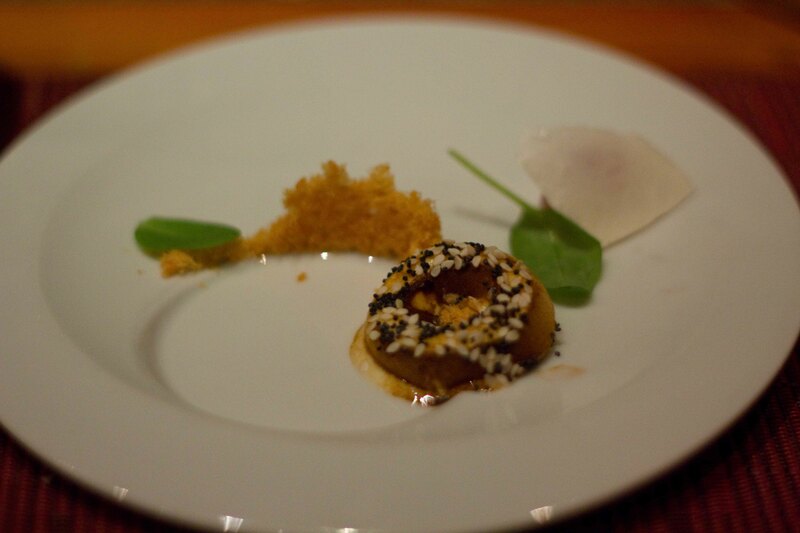 Seeing as Wylie Dufresne’s favourite food is the egg, I was excited about this course. This poached egg was simple perfection. Everything else, including the edible shell, (culinary clay) was superfluous. 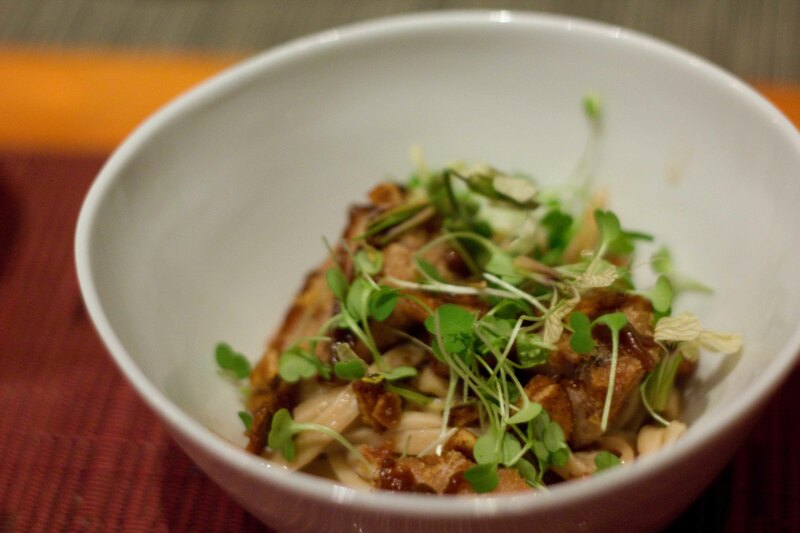 King oyster ‘udon,’ sweetbreads, banana-molassas, pickled ginger. Sweet breads are on my list of foods I never order, so I thought this was going to be my “give-away” course. 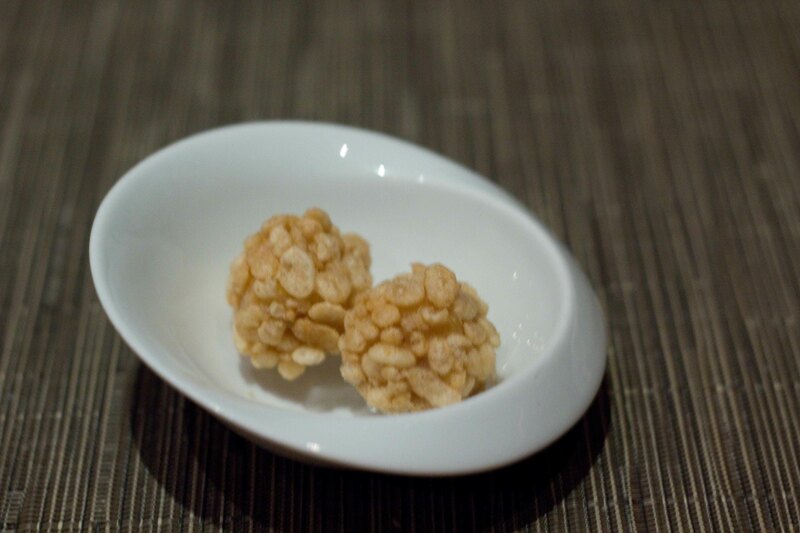 But the crisp sweetbreads made sweeter with the banana-molassas was really good. I guess sweet breads just need to be treated with the right hand. 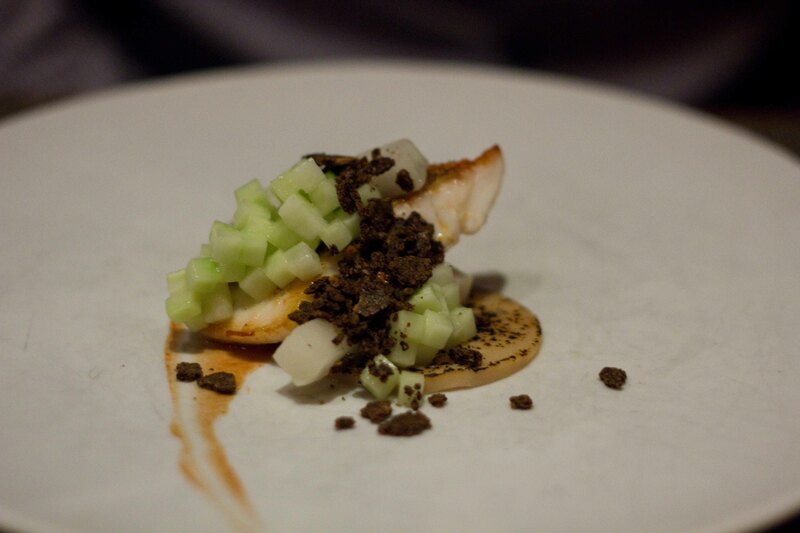 Tai snapper, onion tart, coffee, asian pear. 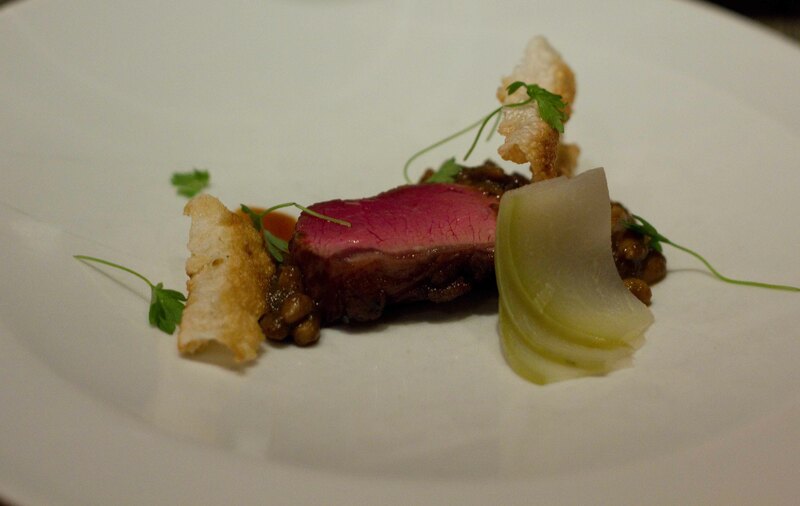 My favourite dish of the night, is represented by one of my worst photos (frustrating!). The quail is de-boned, meat rolled and fried to a delicate medium rare. Eaten together with the sunchoke and other components, the light bulb over my head was burning bright in the knowledge that I was having a very special meal. Lamb loin, ‘red beans & rice,’ chayote squash. What looked like beans were pine nuts and the rice was a crispy rice cracker. 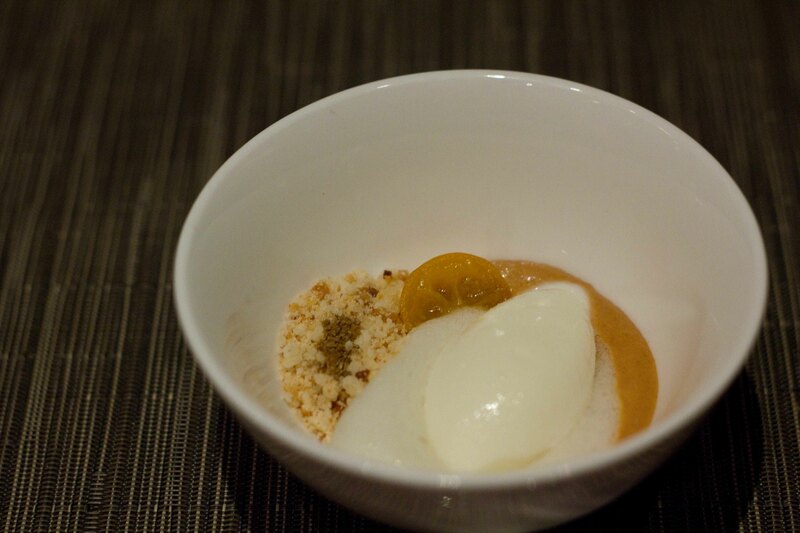 Buttermilk ice cream, kumquat, orange blossom, cumin. Buttermilk ice cream as a palate cleanser? I thought this would be heavy but tasted surprisingly light. I could have had a whole dish of candied kumquat and be happy. 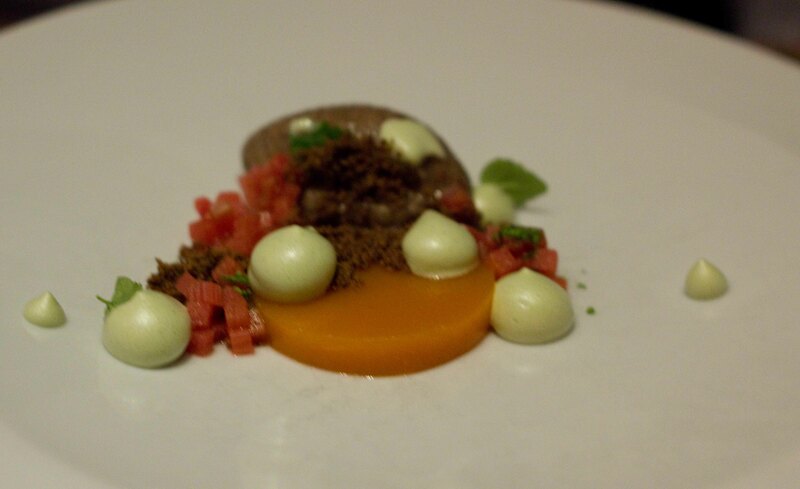 Buckwheat, apricot, rhubarb, green tea. Buckwheat served dehydrated and as an ice cream paired nicely with the green tea pearls, but was brightened by the tart apricot puree and pickled rhubarb. 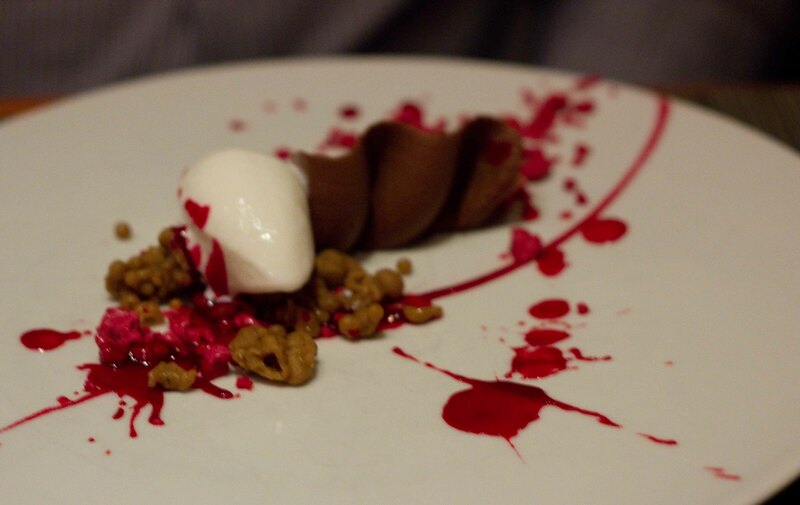 Soft chocolate, beet, long pepper, ricotta ice cream. Wharhol-esque, by this time I’d come to expect all the little nuggets to be dehydrated versions of things, but of course they turned out to be soft. The real wowzers on this plate was the sweet beet flavour that carried through each bite. Rice Krispy coated meringue ice cream. 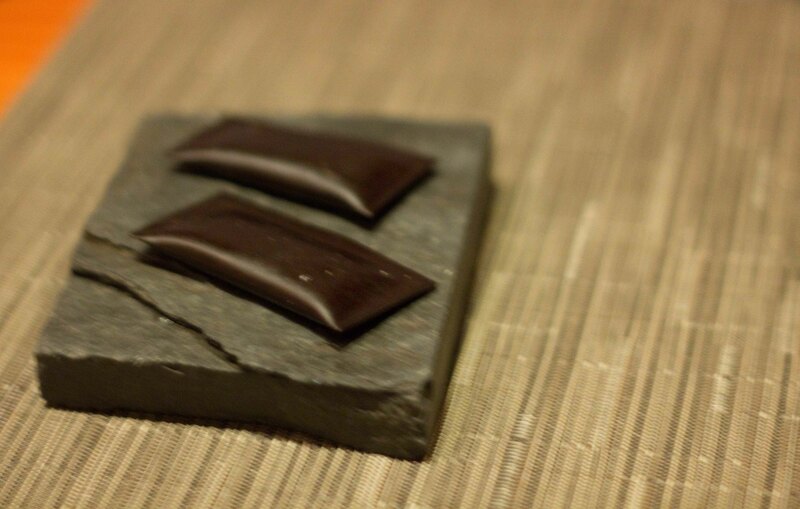 Cocoa packets look like leather and are filled with chocolate nibs. One of the things I appreciated the most about this meal was that with each dish, the chef pushed my mind out of contemporary eating. But also at the heart of each dish were fantastic ingredients with perfectly cooked proteins, something that’s not getting lost in the “bells and whistles”.